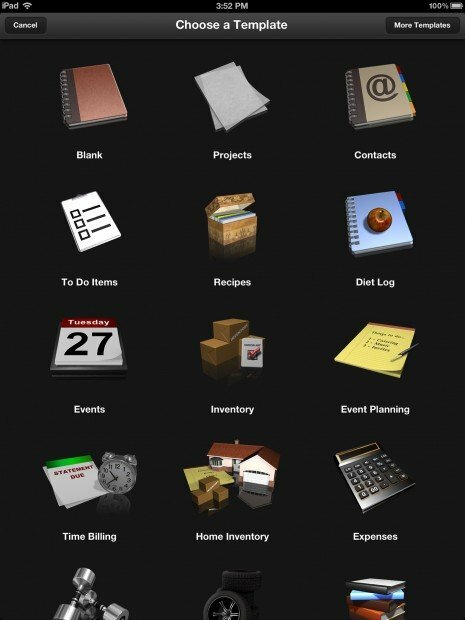 Bento for iPad by FileMaker is a personal database app that allows you to manage all your data in one easy to use app to stay productive and stay organized. Bento 4 brings new features and improvements over the original version of Bento to make an already great database app even better. 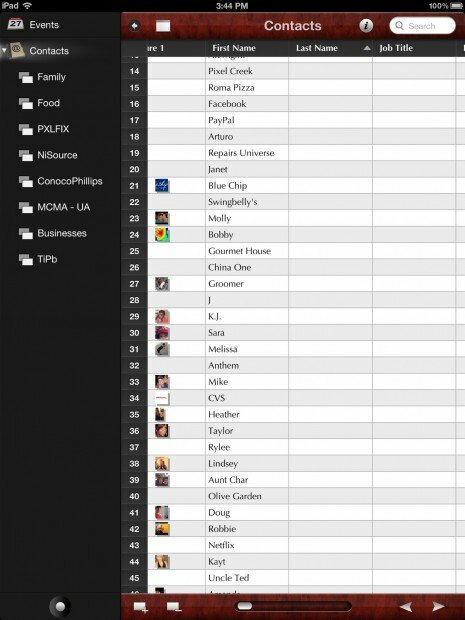 Upon launching Bento on the iPad you'll be presented with a ton of database templates to choose from. 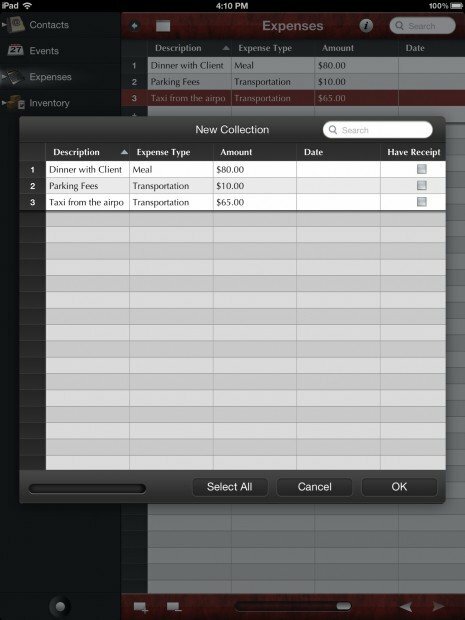 Bento supports everything from contacts, events, expenses, inventory, time billing, and more. If you don't see exactly what you're looking for you can choose Bento's library of templates by tapping More Templates in the upper right hand corner. To start building a database of information just choose the type of template you'd like to build in and you'll be taken into the data entry portion. Depending on the type of database you chose you'll see a list of pre-populated fields to start you off. 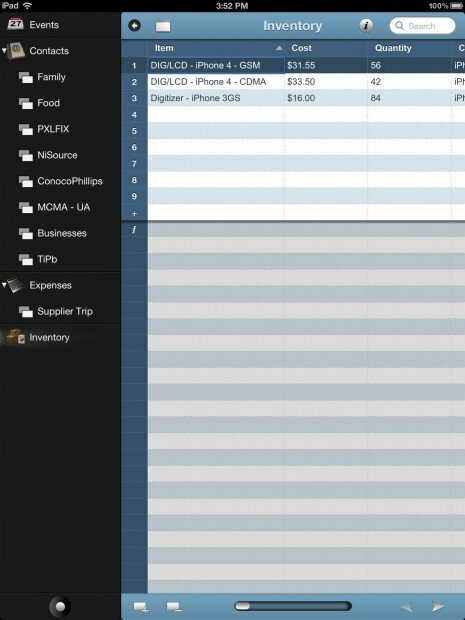 Once you have entered information you can toggle form and sheet view by tapping the icon in the upper left of the sheet that looks like a form. If you're in form view it will show up as a sheet. 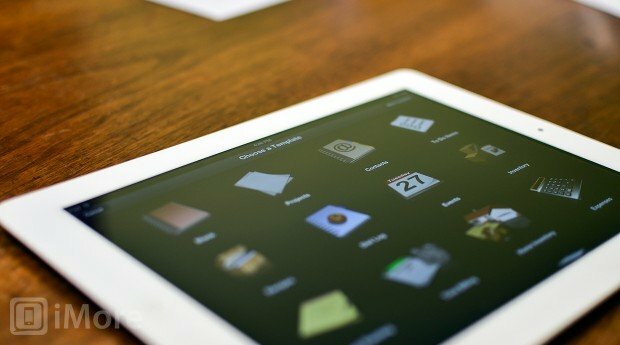 Some types of databases can pull information you've already got loaded into your iPad. The main example would be contacts. If you're choosing to build a contact database inside of Bento it will ask if you'd like it to pull in your existing contacts. I did notice that it wasn't very efficient at matching fields and migrating them over. A lot of phone numbers or e-mails were missing or in the wrong fields entirely so I'd be careful with migrating contacts and check for accuracy before relying on them from within Bento. If you plan on building personal databases involving expenses or inventory you can also split them into collections for better organization. Everything will still show up under the parent library but you can view just certain collections beneath that if you'd like. You can then e-mail any of your databases in a .csv attachment directly from the app. If you've got the Mac version of Bento you can also sync your data between the two. The only down side I've found to syncing is that you'll need to be on the same Wi-Fi network in order to do so. If you don't take your iPad with you to work this may be a problem. Using iCloud sync would have been a much more desirable option. Whether you're a student who needs to organize class notes and schedules or a professional that wants an easier way to keep track of all your data without having to use multiple apps, Bento will get the job done. For business users that need to tie into other software programs such as Quickbooks or other inventory systems it may not be the all-in-one option you need but it can certainly keep other aspects of your business or personal life in order. If you're already a Bento for Mac user you'll find the iPad app to be a great companion for when you're on the go. Even though it can only sync over Wi-Fi for now, it's still one of the best personal database solutions available. While there are other apps out there that provide a simliar feature set, Bento seems to do it in a much easier to use package. Note: Bento is currently on sale. Regular price is $9.99.